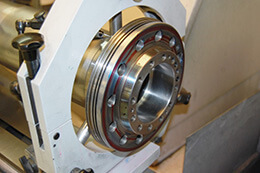 HST provides expert Spindle Repair and Rebuild for most lathes and turning centers. Call 1-603-483-0333. Our factory trained spindle repair experts can restore your lathe spindle back to OEM like new condition with a one year warranty. We have experience repairing spindles on all major brands. Below are some samples of our lathe spindle repairs and CNC turning center spindle repairs. We have over 25 years of experience repairing spindles for lathes, turning centers and complex machining centers. Our spindle repair experience ranges from small super precision Tsugami Swiss Lathes to huge Okuma LOC lathes to multi-axis Mazak Integrex “Done-In-One” machining centers and everything in between. 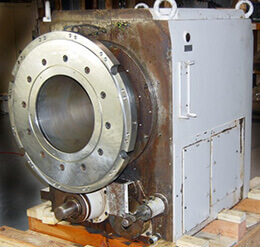 Our experts have the experience, equipment, training and skills to restore your damaged lathe spindle to OEM specifications. Please call 1-603-483-0333 for fast turnaround and OEM quality without the cost of an OEM repair. There are several manufacturers of very large lathes; Samsung, Doosan, Okuma and others. Below are examples of how we repair large lathe spindles. Then we’ll look at some mid-size and small lathe repairs. HST Job I-9679 By far the largest lathe spindles that we repair at HST are the giant Okuma LOC 650s. These are big lathe spindles weighing about the same as a F350 Pickup! Our first Okuma LOC spindle hits our dock. Now what? It’s really, really big. Okuma LOC spindle sitting on the special cart made just for it. Okuma’s Frank G. goes over some of the LOC spindle repair procedures and nuances with HST technicians. Okuma Factory training gives our technicians the edge over the competition. With a spindle as large as the Okuma LOC 650 many individual parts weigh more than most complete spindles. With large spindle repair, extraordinary care must be used; not only avoid injury to the technician, but also avoid damage to the part. There is a lot to know on a spindle like this. We made several special tools to make sure parts did not get damaged and for the protection of the technicians. Just the retaining ring weighs over a hundred pounds and the huge shaft is nearly a 1000 lbs. Special care is the word of the day. Once the spindle is disassembled all parts are carefully cleaned. The new bearings are measured and the cover is precisely ground true and parallel for proper capture. The housing is cleaned and prepared for a new coat of two part epoxy paint. Okuma LOC lathe parts and housing ready for reassembly. Okuma LOC lathe spindle repair before and after. Even after we finished repairing the large Okuma lathe spindle it still presented challenges. We had to run it up for testing! It certainly will not fit on our test bench. So we used one of our off-bench drive motors, a small lubrication pump and ran it up to full speed. The spindle performed like new. Next it was protective wrapped, crating and then off to the customer. HST Job I-0702 This Okuma LU15 lathe spindle repair is certainly not as large as the LOC 650. But it is a good size lathe and a good example of how we typically repair large lathe spindles. The first thing we do with all lathe spindle repairs is to try to determine the cause of failure. If possible we always ask our customers to send us the complete spindle housing. 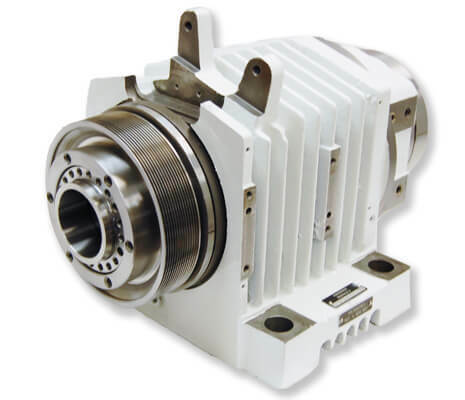 This allows us to set and install the roller bearings and run-in all of the bearings and test everything. We realize that on some of the larger turning centers it can be very expensive to ship the housing. But if it is possible, having the housing is always preferred. After initial measurements the spindle cartridge is removed from the housing. Next we examine the bearings. By far contamination is the biggest cause of failure on lathes and turning spindles. That is because most of them are horizontal and it is easier for cutting fluid to get past the labyrinth seals than with a vertical mill spindle. Lathe spindles are designed for higher radial loads than mill spindles. So almost all of the medium to larger spindles use a combination of roller bearings for radial load, combined with angular contact ball bearings for the axial loading. At HST we use only top name brand ABEC 7 Super Precision spindle bearings for every lathe spindle repair. This is a typical bearing configuration for medium to large turning spindles. Before and after an Okuma LU15 lathe spindle repair. Repairing big lathe spindles present special problems and require special experience and know-how. At HST we have over 30 years of experience and know-how repairing spindles. We also have the advantage of factory trained technicians. 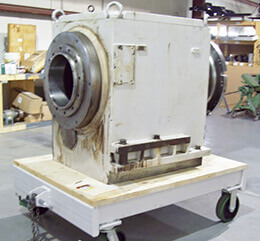 So if your large lathe spindle has worn or noisy bearings, bad part finish and needs repair, we can do it! There is a broad market of medium size lathes and turning centers. Over recent years there have been many new entrants. Most of them are very good. All of them rely on an accurate spindle. At HST we repair lathe spindles to OEM standards. Below are some examples of spindle repairs for medium size lathes. HST Job I-0051 This Doosan* Puma 200 spindle repair is a good example of a medium size turning center spindle repair. This spindle came off of a Daewoo* Puma CNC turning center. 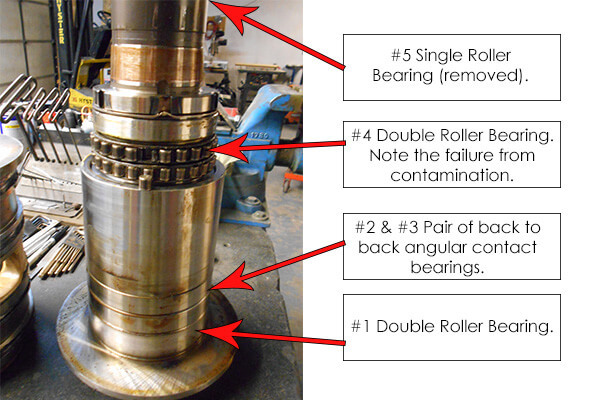 Liquid contamination had penetrated and destroyed all four bearings. Our forensic examination discovered that two O-rings were missing. This allowed liquid to penetrate the interior of the spindle resulting in premature bearing failure. *Daewoo was a company owned by Doosan to promote sales of their machine tools in the USA. Doosan has since dropped the Daewoo name. After a spindle is repaired it is subjected to a battery of tests. All spindles must pass our stringent test criteria. There is no fudging. We provide our customers with all of the test results. Before we ship a rebuilt spindle all aspects of the repair are tested. Spindles are instrumented with equipment for adjusting balance and testing vibrations. 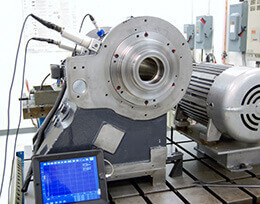 Whenever possible we pressure test all spindle assemblies. HST Job I-0732 This Puma 2600Y lathe spindle is on the large side of medium. Even at this size the specification needed for the run-out was less than 0.0005” TIR. To achieve that tolerance this spindle repair required GPG of the front taper. All bearings were replaced with ABEC 7 Super Precision spindle Bearings. We will only use top name brand bearings. There are a number of excellent small turning centers. Included in this group are Swiss lathes as well as Hardinges. We repair all of these spindle to OEM specifications. HST Job I-0655 Hardinge lathes set a very high mark for small lathes. At HST our Hardinge spindle repairs usually see run-out of less than 1 µm TIR ! The customer who sent this spindle in said it had noisy bearings and the part finish was not as smooth as they needed. Noisy bearings are an early indication of imminent failure. And that was the case with this spindle. It’s not possible for a picture to show how rough these bearings felt when rotated by hand. But the customer did the right thing by taking the spindle out of service before additional damage was done by a seized up bearing. HST repaired this Hardinge lathe spindle. It had run out on the shaft of less than 1 µm TIR. 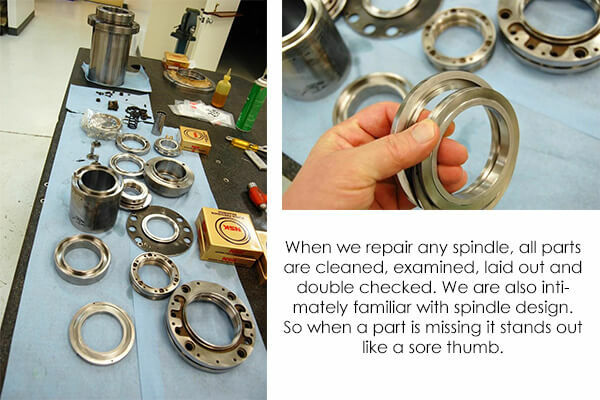 All of our spindle repairs come with a one year warranty. HST Job I-0366 Perhaps some of the most precise rolling element spindle repairs we do are on Swiss lathes. Swiss lathes are a special type of lathe and not necessary made in Switzerland. We repair all spindle brands like Star CNC, Citizen, Swistek and Tsugami Swiss lathes. The performance of the super precision lathes comes close to the air bearing spindles that we repair. This particular spindle repair was on a Tsugami Swiss BU-38-SY lathe. The spindle failed because of liquid contamination in bearings. However this spindle had indication of other issues developing before the bearings failed. Fretting under the drive pulley indicates a loose fit that can result in vibrations. Bearings failed because of liquid contamination. When the repair was complete the spindle was ran like new. The worn spindle shaft was restored to correct size to eliminate vibration due to a loose fit. The bearings were replaced with only the best. When the repair on this Tsugami Swiss Lathe spindle was complete the run-out was sub-micron. These spindles are amazing. If your lathe is making bad parts and needs new bearings we can repair it. We can repair worn or damaged lathe spindles. At HST we repair all make and models of lathe spindles. We will only use top name brand ABEC 7 super precision spindle bearing in your repair. So if you have a problem give us a call 1-603-483-0333. Anytime during business hours we’ll answer the phone.